Senator representing Kogi West, in the National Assembly Dino Melaye has said that the autocratic reign of Kogi State Governor, Alhaji Yahaya Bello will soon come to an end in the State. The embattled Senator who described the governor as another Pharaoh assured Kogites that the Egyptians they see today, they shall see them no more. 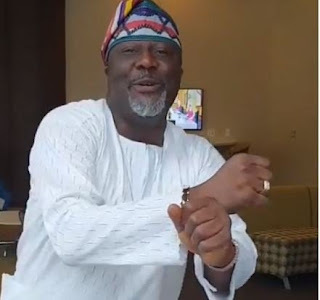 Melaye, while addressing newsmen in Lokoja on Friday, described the senatorial candidate of the All Progressives Congress (APC), Smart Adeyemi as his ‘political wife’. He assured electorate in the state that their votes will count as the Peoples Democratic Party (PDP) will frustrate all rigging plans in the forthcoming elections. The embattled Senator was in Lokoja, the state capital, in continuation of his ‘Thank You’ tour of all political wards in Kogi West. He toured communities in Kogi/Koton Karfe local government area of the state on Thursday. He told the cheering supporters at St. Luke Primary School Adankolo that his opponent, Smart Adeyemi is his good ‘customer’. “The forthcoming Kogi West senate election is between me and my political wife, Smart Adeyemi. He is my wife. He is a good customer. “I want to assure you all, by the grace of God, PDP candidates will emerge victorious in the forthcoming elections. Please, let us defend our votes, after voting don’t go home, stay and count your votes. After counting, stay for the announcement. They cannot intimidate us. The reign of King Pharaoh in Kogi state is coming to an end and these Egyptians you see today, you shall see no more. We are going to defeat them mercilessly,” he said. He expressed confidence that President Muhammadu Buhari will lose the next presidential election. Melaye said the large crowd of voters that graced each venue of the ‘thank you’ tour is an indication that the people are tired of the Federal and Kogi state governments. “I feel very happy. The responses across Lokoja are positive. It shows that the people are not happy with the government. This is a referendum against the federal and Kogi state government. “From the responses so far, it is obvious that the people are living in pervasive hunger. It shows that the non-payment of salaries and pensions have completely disconnected the people from government. It shows there is a lot of work to be done by us when we win elections. We will correct the anomalies. “The people have decided and we will not allow our elections to be rigged. We have credible information that they sowing military and police uniforms. We will defend our votes, we will defend our votes and PDP will be victorious,” he added.